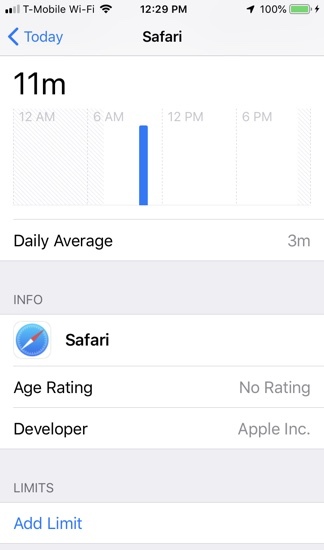 If you have a child that uses your iPhone or iPad, you’ll appreciate the Screen Time feature Apple introduced in iOS 12. 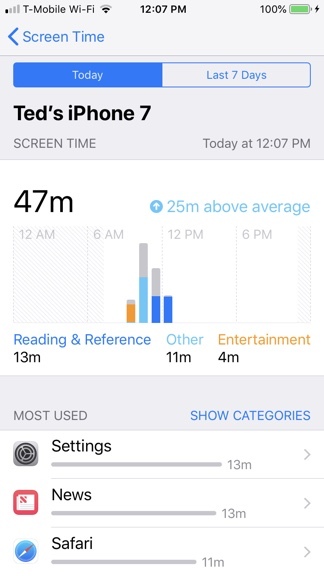 Screen Time allows you to monitor and set time limits on app usage for an iOS device. 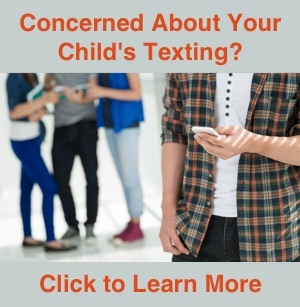 This is very helpful for parents to limit the time children are using an iPhone or iPad. Screen Time has a variety of settings and options, but this article will focus on monitoring app usage and limiting the time your kids spend on their device. There are also features for content and privacy restrictions, which is similar to the restrictions settings available in older iOS versions. 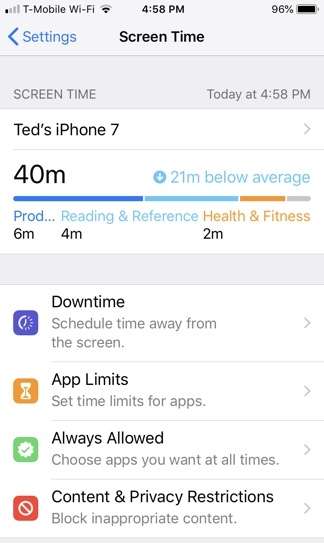 Going to Settings -> Screen Time will display a basic top-level bar graph of usage. You will see the name of the device just above the bar graph. Tap on the device name to display a more detailed usage summary along with a list of the most frequently used apps. The app usage can be viewed based on the current day or the past seven days. This helps determine which apps your child spends the most time using. Before creating an app limit it’s useful to set a passcode for Screen Time. After all, setting time limits isn’t very helpful if your child can simply over-ride them. Setting a passcode will not allow anyone to over-ride the limit without entering the passcode. The Screen Time passcode is separate from the passcode used to unlock your device, so you can set it to any 4-digit code you want. 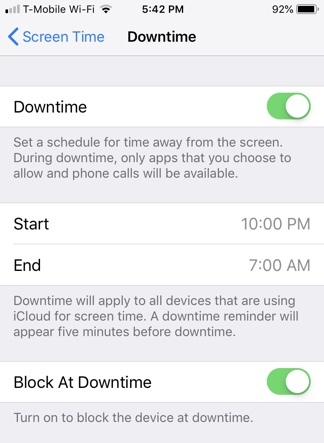 Create a Screen Time passcode by going to Settings -> Screen Time -> Use Screen Time Passcode. Follow the on-screen instructions to set a passcode. 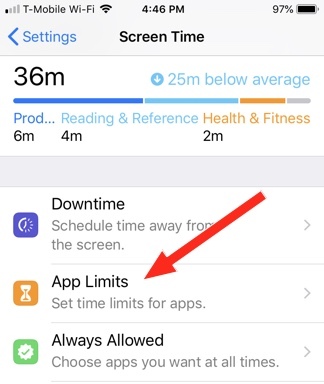 There are two ways to setup app limits in Screen Time: by app category and by individual apps. 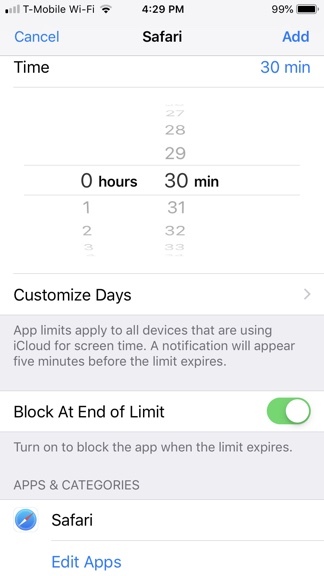 To create limit for a general app category, such as Games, go to Settings -> Screen Time -> App Limits. 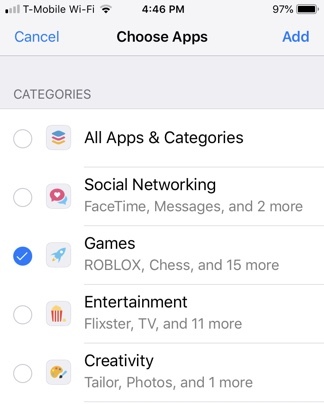 Tapping Add Limit will allow you to select a category of apps, such as Games. While this can be helpful to quickly limit a group of apps, it isn’t always easy to identify if a particular app is in a certain category. 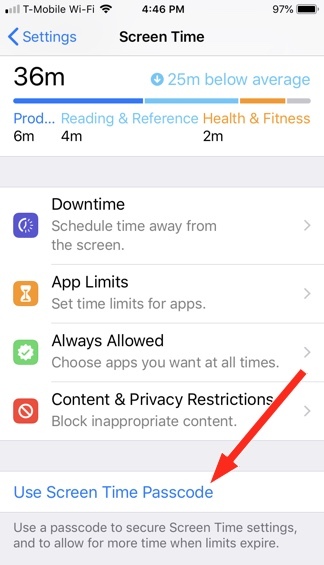 To create a limit for an individual app or a custom group of apps, go to Settings -> Screen Time and tap on your device name. You will see the monitoring information for app usage as described above. Tap on an app for which you want to create a limit. A window will appear providing details about that app’s usage. 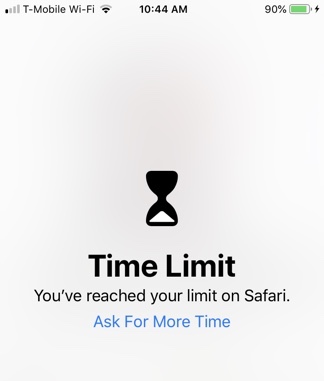 In this example we will set a limit for Safari. At the bottom of the window, tap Add Limit. You can now set the time limit for using the app and even customize the time for individual days. Be sure to enable the slider for Block At End of Limit to stop the app from being used when the limit expires. You will have the option to enter the Screen Time password to unlock the app after the limit expires. Select Edit Apps at the bottom of the window to add additional apps to the limit. Tap Add in the top right corner when finished. As the time limit approaches you will receive an alert to remind you the time limit is nearly up. Once the time is up, the app will be blocked. There is an option to Ask For More Time. Entering the Screen Time passcode will allow for a time extension. Downtime basically blocks access to a device during a specific time period, except for allowing access to Phone, Messages, FaceTims, and any apps you have approved for use under the Always Allowed section. Activate Downtime simply by choosing a start time and an end time for the device. This is useful to restrict your child’s access at bedtime or during family time. The features of Screen Time have given parents some helpful tools to manage their child’s iPhone or iPad usage.